2012 PEACE POSTER WINNERS ANNOUNCED The 2012 Lions International Peace Poster Contest winners in Belle Fourche! The winners were announced on Thursday (11/8/12) at the Lions meeting at the Stadium Grill. First Place winner John Maher is in front at left. Next to him is Caden Kinter, Second Place winner. Remember, you can click on the image in order to select a larger version of the photo. 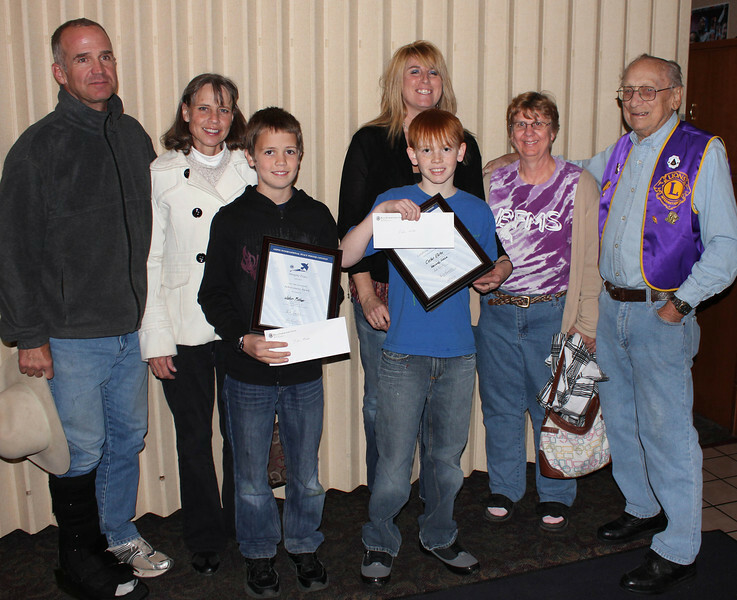 In the back, left-to-right, are John's parents, Jim and Jean Maher; Caden's mother, LeAnn Steffen; Kristy Messner, supervisor of the Peace Poster Contest in the Belle Fourche Schools; and Lion Bill Kunerth, Peace Poster Chairman. Congratulations to the winners!